Persimmon Hollow Brewing Company is a microbrewery that encourages you to “Drink sensibly. But get weird".” They approached me to work on some unique labels for a couple limited run beers. 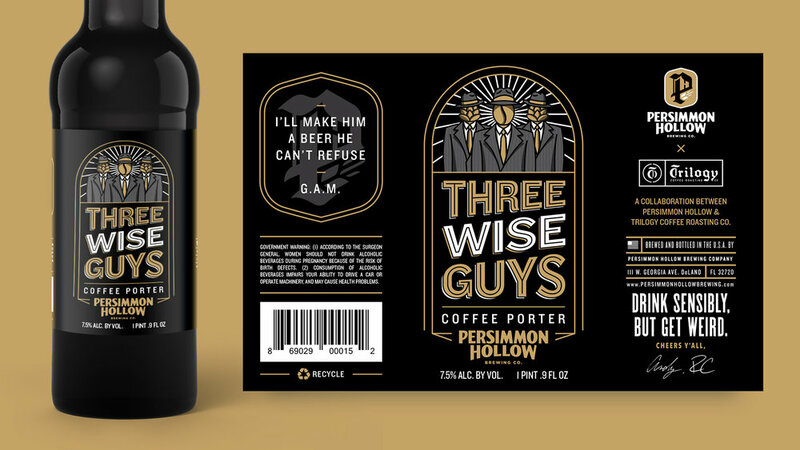 Three Wise Guys is a coffee porter collaboration beer. The two owners of Persimmon Hollow teamed up with neighboring coffee roasters, Trilogy, to brew up something truly special. The inspiration for the label is based off of a nickname, the Georgia Ave. Mafia, derived from the Street the two companies are located on. N’ere a T’ing is a Scottish Imperial Ale, both heavy and delicious. The label was inspired by a trip to Scotland and the age old joke about asking whats under a Scottish Man’s kilt. To which they reply, “N’ere a T’ing.” Roughly translating to not a thing.